The workplace, just like the domestic home, has to be kept clean. In fact the workplace probably requires a higher level of cleanliness than the home due to it being a professional environment. If you are the owner of your own business, or have just been charged with maintaining its cleanliness, then give us a call here at Fulham Cleaners on 020 3743 8436 – our team of trained SW6 office cleaners can take care of all your office cleaning needs. Our professional Fulham cleaners SW10 will come into your place of work either before the working day begins or after it ends and have it looking pristine for you and your employees or colleagues. Our team of office cleaners Fulham pride themselves on providing the highest level of customer service. You can be sure that if you book our service, our professionals will show up on time and do an efficient and reliable job, giving you peace of mind over the cleanliness of your office. With reliability comes professionalism. Our professional cleaners SW6 have been doing what they do for years – they come armed with the expertise needed to ensure your office is cleaned to the standard you require. If you chose to hire our office cleaning Fulham service, you will be getting the best service money can buy. All of our agents are trained to the highest standard and pride themselves on their professionalism. Although cleaning a domestic home is common place, cleaning your own office is unheard of. All businesses usually have a budget set aside for office cleaning, and our service will most likely fall into that budget. If it’s small office, you could probably tidy it yourself – it most likely only requires a quick vacuum and wipe down. But who wants to finish the 8 hour day and then have to vacuum up after everyone else? No one. This is where we come in – hire out our service and you can be sure that when you walk into your office the next day it will be spotless. If you’ve been charged with cleaning a large office, doing it yourself is almost unheard of. Use your allocated budget on our Fulham office cleaning service to give you peace of mind. As the majority of offices are the place where the majority of employees within a business work, a clean environment is essential for productive business. 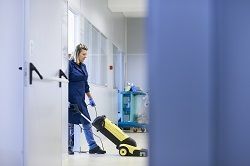 If your employees look around the office to find the carpets haven’t been vacuumed, the sides haven’t been wiped down and the bins haven’t been taken out, the perceived lack of professionalism will trickle down to them, meaning they will not work as hard. As offices are also a place to meet clients, having an untidy office will have adverse effects on their willingness to do business with your company. Don’t let this happen to your business, book one of our Fulham commercial cleaners to make sure your office is pristine. These are just a few reasons why you might require an office cleaner. Whatever your reason, call us here at Fulham Cleaners on 020 3743 8436 to get a free quote, to book an appointment, or to ask any other questions you might have. Our dedicated Fulham office cleaning agents are standing by and ready to answer any questions you might have. Don’t hesitate to call us – we could really save you a lot of time and effort for a price not as expensive as you may think! Description: A fascinating cleaning company in Fulham offers you domestic and commercial cleaning SW10, upholstery and carpet cleaning SW6.